Following hot on the heels of Apple’s reported problems with over-heating Macbook Air laptops, whispers emanating from Cupertino suggest Apple intends to launch a surprise raid on the lucrative small kitchen appliances sectors. 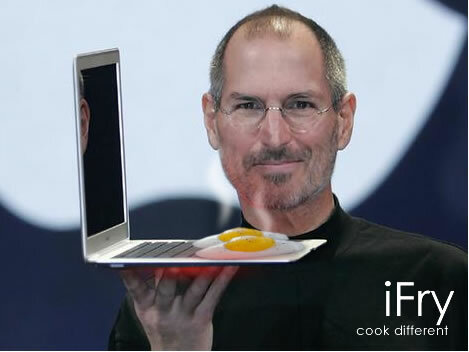 Sources believe the vanguard will be lead by their new iFry Personal Grill — a compact, low-fat cooking device designed to take the appearance of a small notebook computer. “Fat is designed to run off and pool beneath the keys leaving the food low-fat and tasty” said one industry insider. Although some industry analysts are predicting wok and fondue attachments due in the third quarter, at this time those reports are being consistently refuted by Apple management. As always, Apple have added their own techy spin to the product designed to set it apart from competitors within the sector: the iFry is believed to be able to operate as a fully-fledged, Mac OS computer at lower temperatures.